According to the game's director, Call of Duty: Black Ops turns the emotional focus up to eleven. Treyarch has thrown out the normal FPS hymn sheet for Call of Duty: Black Ops. Gone is the strong and ever-so-silent protagonist, and in his place is someone who possesses relatable traits like, say, a face and a voice. Treyarch is hopeful that this will help draw the player into the story more completely. The game opens with the "interrogation" of lead character Alex Mason. He's strapped to a chair, and a shadowy figure gives him a few thousand volts of encouragement if he's not forthcoming with his answers. It's a tense scene, and Dave Anthony, Black Ops' director, says that was deliberately designed that way to get the player identifying and empathizing with Mason right away. 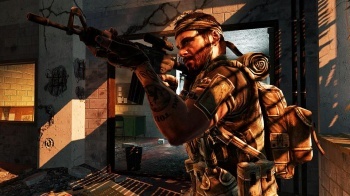 The game's levels are actually Mason's memories of past missions, and Anthony says that you will get to see how Mason's relationships with the characters in the game change as he relives his past. "The emotional focus that we've given Mason is more than we've ever done before for a character in a 'Call of Duty' game," Anthony says. "As you go through the story ... You will actually realize how it all comes together." Early last month, Treyarch announced that David Goyer, the screenwriter that penned the Dark Knight, would consult on the script. Gary Oldman and Ed Harris are voicing characters in the game, and an insider source suggests that lead character Mason is played by Avatar actor Sam Worthington. Call of Duty: Black Ops comes out for Wii, Xbox 360, PC, and PS3 on November 9th.